It’s been three months since Typhoon Haiyan – also known as Yolanda – devastated parts of the central Philippines, killing thousands of people and leaving behind a trail of devastation. One thing that struck me when I travelled to Tacloban was the size of the humanitarian contingent still on the ground. Their presence is crucial. Even though reconstruction is well under way, there’s still a lot of work ahead. Tacloban has come to symbolize the ravages wrought when the super typhoon slammed ashore on November 8, 2013. I travelled there to document the work carried out by ILO teams and talk to some of the beneficiaries of the emergency employment programmes put in place by the ILO and the Philippine Department of Labor and Employment (DOLE). Very quickly after landing, it became clear to me that – as is the case in so many natural disasters – the super typhoon mainly affected the poorest members of the community, those whose homes were the least solid and often built along the coast. Those people who were already struggling to make a living are now in an even more precarious situation, living in tents or under makeshift shacks. They are more vulnerable to environmental health hazards, and could become easy prey for human trafficking. The victims I talked to had one simple request: they need the means to resume earning a living as they did before Haiyan devastated their lives. Romeo doesn’t want to depend on international aid, he simply wants to resume work as a welder. 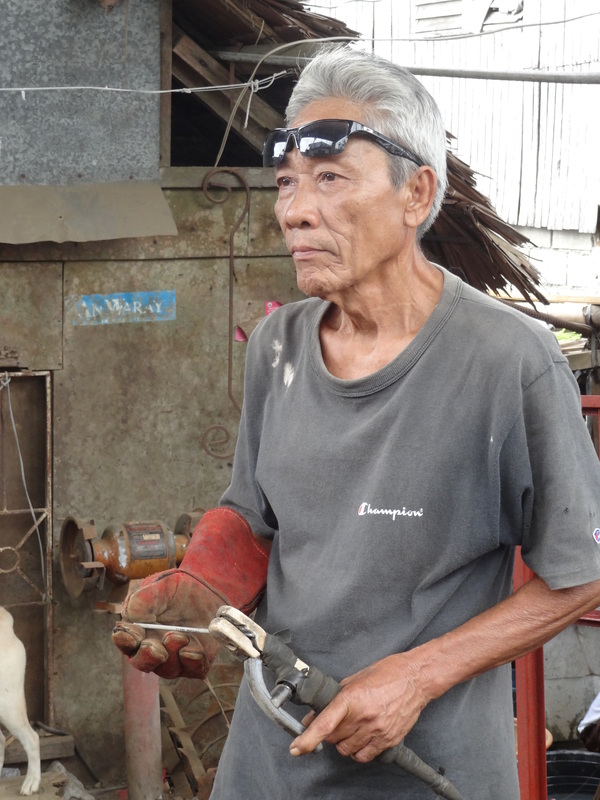 But wants to resume work as a welder again.In the town of Basey, on Samar Island, I met Romeo Ellaso, a 59-year-old welder. He told me he can’t exercise his trade and provide for his family, as he lost all his tools to the typhoon. He did manage to get some cash, clearing rubble as part of the ILO’s two-week emergency employment programme. That money went to the most pressing repairs to his house, which was badly damaged by the typhoon. Like many others I spoke to, Ellaso does not want to depend on international aid. All he needs at this stage is a job and a salary to buy the tools of his trade so he can work as a welder again. But is it possible to go beyond that and help Haiyan’s victims build back better? That’s what the ILO is trying to do. As a first stage, the two-week emergency employment programmes provide not just a job, but a decent job, with a minimum salary guarantee, protective gear and clothing, and health and social security contributions. Some of the programme participants are then offered skills training or advice to enable them to set up an enterprise, and stand on their own two feet. Lilibeth lost her husband and three children to Haiyan, yet all she wants is help finding a job that would enable her to carry out the role of head of household. 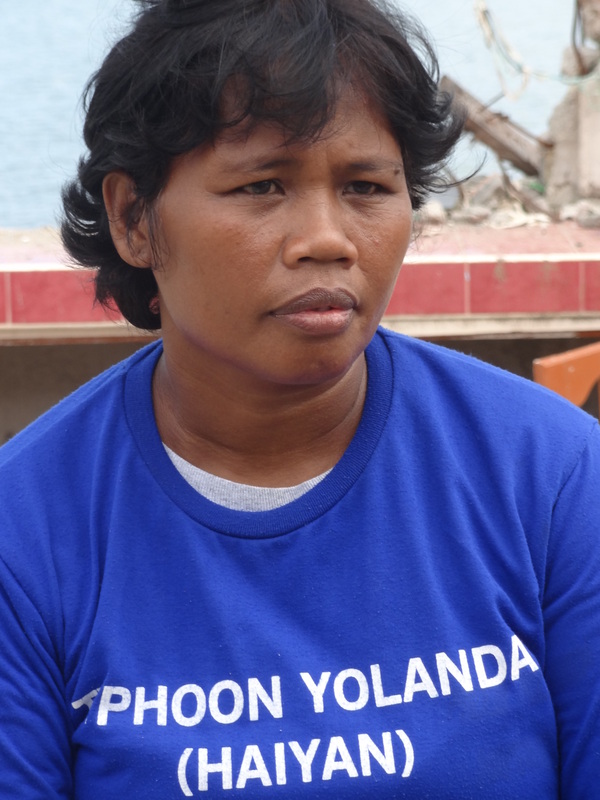 Even 37-year-old Lilibeth Planas Sevilla, who lost her husband and three of her four children to Haiyan’s fury, did not ask for financial support, just for help in finding a job that would enable her to carry out the role of head of household which this tragedy imposed upon her. She has learned to cope on her own with her loss, even if her tears sometimes betray her intense sadness. But she needs a helping hand getting back on her feet. She’s not asking for much and deserves to be heard. This entry was posted in ILO posts and tagged Haiyan, philippines, Typhoon, Typhoon Haiyan, Yolanda by ILO Blog. Bookmark the permalink.